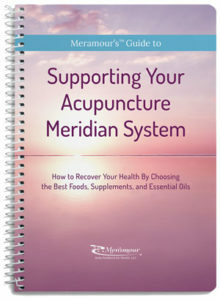 Meramour’s Guide to Supporting the Acupuncture Meridian System teaches you how to improve your health by choosing foods, supplements, and essential oils using basic pulse diagnosis and muscle-testing techniques. 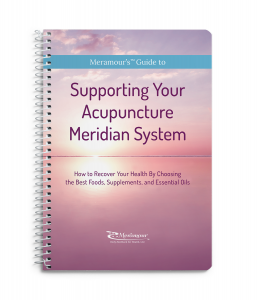 Health challenges, genetic influences, trauma, stress, and exposure to environmental toxins can create imbalances or weaknesses in the acupuncture meridian system. By incorporating Meramour’s techniques every day, you will encourage self-healing and regeneration to improve your quality of life. Meramour’s Body-Feedback areas reveal the health of each meridian and its associated organs. By checking these areas for tenderness or tightness, you can monitor the health of each meridian and organ. When you find an imbalance, Meramour’s muscle testing techniques will guide you in choosing the best foods, supplements, and essential oils to correct the energy flow to the meridian and organ. Knowing what supports your health enables you to make educated decisions that help you to feel your best at every age.